Bella Sera Organic Mattresses are now made from GOLS certified organic latex! Our customizable organic mattress starts with a layer of dunlop natural latex in the middle. The natural latex is then wrapped in an organic cotton and organic wool cover with a zipper on the underside. Flame retardants and chemicals are never used in this mattress. Bella Sera’s customers love the customization options that are built in to the purchase of a Bella Sera organic mattress! Your choice of firmness levels for each layer not only guarantees a great night’s sleep, it creates much variety in the comfort and firmness levels. 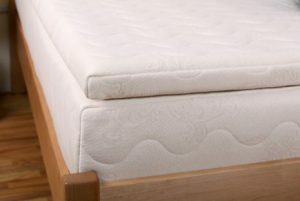 There are three, four, or five layers of latex per mattress, depending on the model. Each layer’s firmness is decided by you: “soft,” “medium,” or “firm.” Read more about fully customizing your mattress. You can also visit our online firmness guide. The customization options do not stop there! 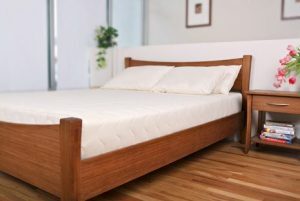 When you purchase a queen- or king-sized organic mattress from Bella Sera, you can choose your ideal firmness level for each side of the mattress. If you prefer a firmer bed and your partner prefers a softer sleeping surface, the latex can be split so that each side of the bed consists of a different combination of latex. Read more about customizing your mattress. Bella Sera’s organic mattress is made from only the highest-quality materials: certified organic wool, certified organic cotton, and USDA certified organic latex. These organic mattresses passed rigorous national flame-retardant standards without the use of toxic flame-retardant barriers or chemicals. Our mattress actually passed these rigorous standards just by using naturally flame-resistant organic wool! Options and Flexibility: The firmness level of your mattress can be adjusted after you receive it, and it doesn’t require the purchase of a new latex layer or an exchange! Find out how to adjust your firmness. If you aren’t completely satisfied with the comfort and/or firmness of your mattress, you have the option of changing the firmness of latex layers. More info about our 90 day comfort guarantee. Latex mattresses are very heavy and can be quite awkward to move. Whereas innerspring mattresses have a rigid, easily movable structure, latex is flexible and, well, droopy! 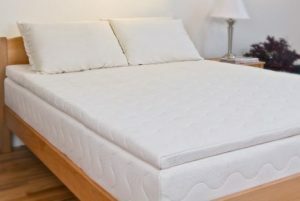 It is quite challenging for us to move a king- or queen-sized latex mattress without two or three strong individuals. Even then, it can be a challenge to grasp the mattress to move it without ripping the organic cotton and wool cover. If we were to ship your mattress completely assembled, the latex layers would shift and bunch up inside, making it necessary to unzip the casing and realign your latex layers anyway. To prevent the bunching up of your layers, we ship our mattresses in separate parts: Your casing is shipped separately from your latex layers. Once your shipment has arrived, lay out the casing on the foundation or bed frame; align it; and unzip the top portion of the casing from the bottom portion of the casing. Begin layering the latex on the bottom of the casing until the layers are in the preferred order. Place the top of the casing over the latex and zip up the mattress. You will receive more detailed instructions with your shipment. If you feel you may be unable to assemble your mattress properly, please contact us for different shipping alternatives. What is the difference between natural latex and natural rubber? Nothing, they are the same thing! Some manufacturers prefer the term latex and some prefer the term rubber.